For Hanukkah, I got my daughter a complete sewing kit. Most people would probably just go to JoAnn's or Hancock Fabrics, find a ready-made kit and be on their way....but not me! 1. A box. My mother and grandmother had those really cool, old school wicker baskets...that no one makes anymore. 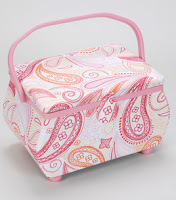 I bought a curvy padded sewing basket from JoAnn Fabric and Gifts. Here's a link to a similar basket. 2. Scissors. And not just any scissors. At a minimum, there will be 3 different kinds. Fabric scissors or dressmaker shears: These are good for cutting large amounts of fabric, stabilizer for applique and other fabric needs. They will quickly become dull however, if you allow them to be used for other things. Typically the blade is longer (4-5" or more) and the handles are angled so that the blades stay flat on the table or cutting surface. Embroidery scissors: These are very small and very sharp. They are best used for cutting small threads or little pieces of fabric in an applique. It is important that these scissors are strong and that they are kept sharp. Rotary cutter: This is a circular blade on a wheel with a handle. It is designed so that you can cut a consistent, straight line without stopping. Again, the blade needs to be kept sharp and the rotary cutter should be stored safely away from small children, as it is easier than the other two scissor types, to cut yourself. 3. Needles. There are three kinds of needles that should be stored in a sewing box to call it a basic sewing box. Machine needles: There are lots of brands and lots of sizes of machine needles out there. It is important that if your machine only uses a particular brand of sewing machine needle that you get that brand. Otherwise, I prefer the singer brand sewing machine needles. In terms of what size needle to get, that depends on your fabric/project. The project determines the needle size. this means that with lighter weight fabrics you will use a finer needle gauge and with heavier fabrics, you will use a larger needle gauge. Hand sewing needles: These also come in different sizes, different guages and different lengths, they are all intended for different projects, fabrics and threads. Head needles or straight pins, whatever name you want to use, either way, these are the straight needs that you use to pin your fabric as you work. It is a tedious and annoying part of any project, but oh, so necessary. 4. Thread; comes in as many colors and thicknesses as you can imagine! 5. Cutting board, any style will do. But make sure you include one. These are very useful when using a rotary cutter. Most are self-healing, which means you can use them over and over again without them loosing their shape. It's handy to have so that the rotary cutter does not cut the table or some other surface. If I think of other things, I will be sure to come back and add them. If you think I left something out, feel free to add it to the comments!